I love Valentine's day. It may be corporate consumerist event created by Hallmark , somewhat commemorating a 14th century Roman saint martyred in some horrible way (as was the general fad in the middle ages), but I don't think that dilutes what it's about... love! This is a somewhat special a post because I've asked for some community help in writing this - about how much love goes into, around, and through the fiber arts community, and in most handmade makes. Here in the world of handmade goods there is a lot of love going around. Like many of us in the fiber arts community, my nana taught me the basics of how to knit and crochet. One of her earliest creations was a little sweater for my "Bubown" so named from Eric Carle's Brown Bear, Brown Bear, What Do You See? A Classic of course. Can you see the resemblance? Probably not much anymore. One thing that you can clearly see, however, is that Bubown has been incredibly well loved. He's missing patches of fur on his chest, some frostbite to his nose, and has some fluff beginning to show behind his eyes. I'm sure my nana was afraid that any more aggressive toddler love would reduce him to a pile of fluff. So she knit him the sweater he's wearing. This was perhaps my first instance of equating handmade goods with love. There are many examples of handmade love and I'm going to share some of my favorites. Mr Roger's cardigans, that he changed into before every television episode, before giving children that hour of love and respite and curious adventure, were all made by his mother. He reported that she made a sweater nearly every month, and he and all his siblings were often gifted them on holidays. So everyday on the show, til she died, he was wearing her sweaters. As you can hear on this Neighborhood video, there was a very personal reason why Fred Rogers wore those sweaters. In the clip above you can see her picture, and several of the sweaters she made. (I'm not crying!). Sweaters are so much a part of his persona, that you can get a mug where his sweater color changes when you add hot water! Oh and it's covered in affirmations that you're doing a good job and are loved. What a delicious circle of perpetual love! She makes him sweater with love, he wears the sweaters and gives the love back to others. I do love that aspect about wearable handmade gifts. You can literally cover another person in that love. This year on Instagram I reached out to you guys to tell me some of your own handmade love stories. Below are just a sampling of my favorites! 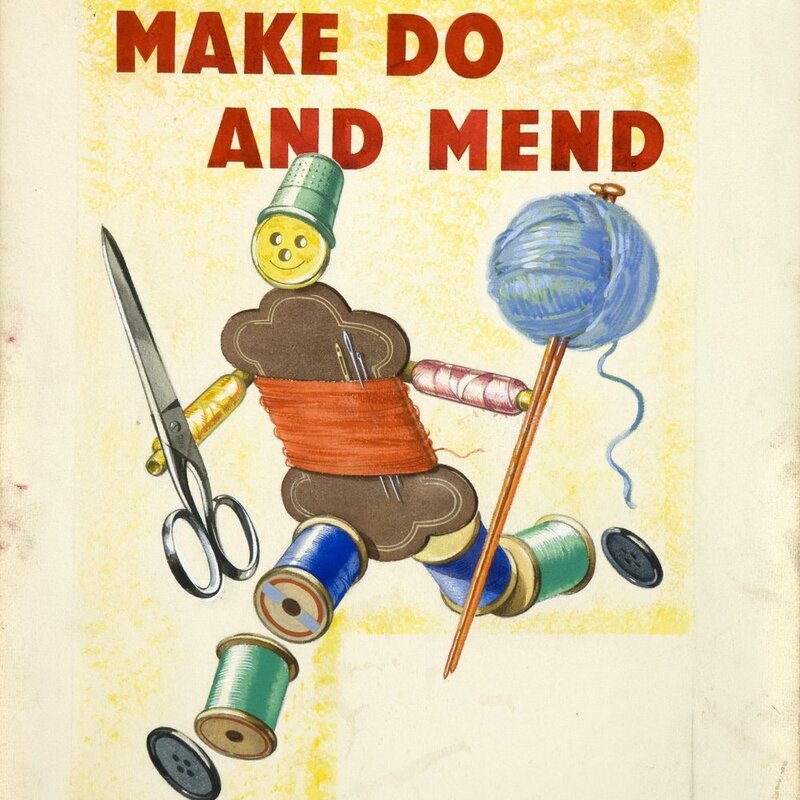 When I was five years old my grandmother put some felt in a hoop and gave me a darning needle. She used a washable marker and told me to “connect the dots” with the thread. She also showed me how to mend my clothes and put buttons back in place. She is 88 years old with arthritis and she is also going blind. I now have the pleasure of mending/hemming her pants and embroidering dish towels for her since she can’t do it anymore and my mother never learned. Love is using the lessons and giving the patience back. I still have a crochet blanket that was given to me when I was born. I still cherish it and it’s so beautiful still. It’s the reason why I taught myself how to crochet, I wanted to be able to gift my friends with homemade blankets to be cherished when they had children. I’ve gifted about 8 blankets so far! [...] My grandma had made a purple crocheted shawl, and she wore it everywhere (at least in my memory I can’t seem to remember a moment without the purple shawl). I was constantly sneaking with it to play, it was the perfect shawl to wrap up my dolls, create a bundle bag for my picnics, and it was a great cape when I was a wizard, a dress when I was a princess, even the perfect mermaid hair. It was the best shawl. Now as a grown up, I know it was the best because my grandma had made it, it was unique and a part of her that was constantly present in my games. We lost it a few years ago, but I keep meaning to make one like hers… With a different kind of magic but hopefully ready for more adventures with my future children. Peter, my husband, probably feels the brunt of my aggressive adult love. He's the first person I want to make something for after I've learned a new skill. I think he has mixed feelings about this, as the things I learn and want to make for him aren't always to his tastes. 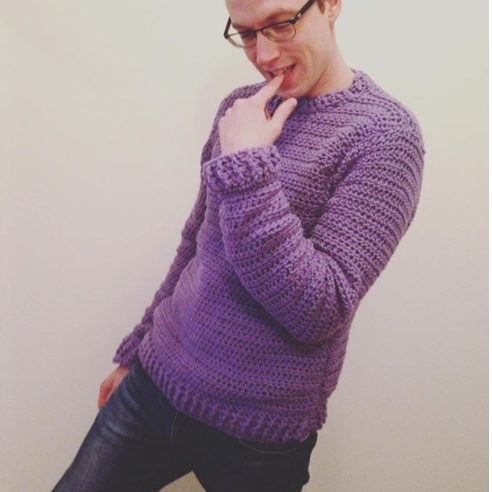 Like the time I made him a bright lavender sweater because I thought he didn't wear enough color. In a twist of fate I ended up wearing it on a walk during which he proposed to me because "goddamnit someone should wear this cute sweater." Peter sometimes complains that he wishes he could make me things too, which is a silly thing. He makes me things all the time even if he doesn't knit or crochet them. People have different ways of making things, Peter makes dinner, and bread, and lots of other tasty things. He also made the small table I do most of my instagramming on. It's a consistent background and foundation of all my new makes. I like to think there's a happy figurative metaphor in there somewhere about me and him. So tying up this story of love and making. 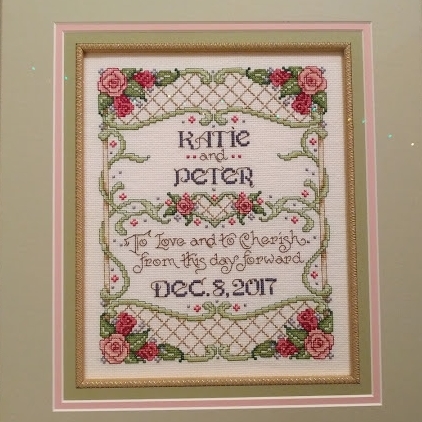 This December, for my wedding, my nana gifted me my own needlework to hang in my future home. I cried (of course). For Christmas I gifted her the Escher-Esque Throw Blanket, she cried. We love each other and we cry a lot. So in short, spread love today! Make something for someone, even if it's your bed, even if it's dinner, even if it's just "effort". It always means more than you now, even if it is a consumer holiday! If you need ideas I have a free pattern for the Queen of Hearts Hat, and soon I'll have a proper pattern out for the Treat Yo Self Top.